…..until death do us part. I don’t even remember hearing those last five words of my wedding vows, never mind actually comprehending them. Death in my mind was for when we were old. That was a long ways away. Except that it wasn’t a long ways away. It was a mere 20 years. Enough time to fall head over heels in real love. Enough time to experience some tough things together, enough time to have five children, enough time to buy a couple of houses together, enough time to get in tons of debt and get ourselves out of debt, enough time to finally “get” what marriage was all about. But still not enough time. 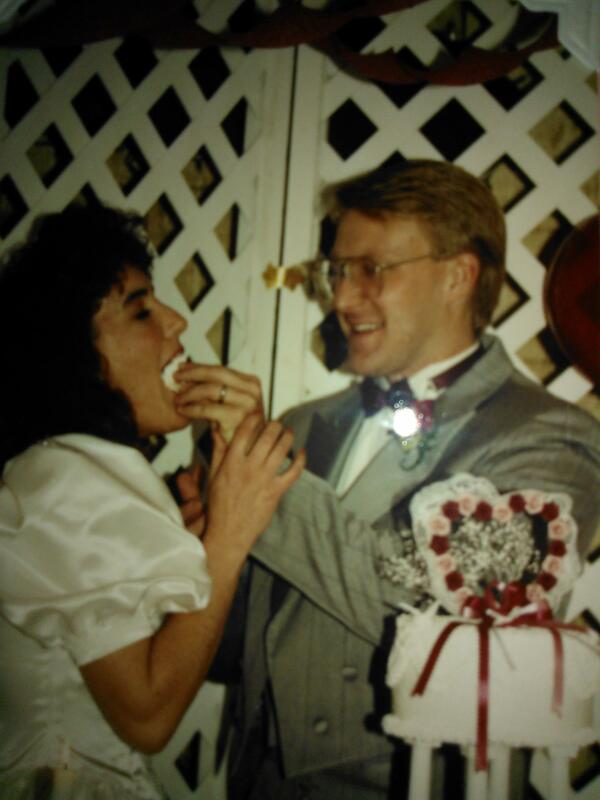 Today marks what would have been my 21st wedding anniversary. Last year I marked the day by sitting at my husbands grave, barely a month into being a widow, and read all of the letters/cards he had written to me over the years. Can I just say that seems like ions ago? I think this year I might be able to look through our wedding album..something I haven’t done since Chris died. Not long ago I came upon Emma sitting on the floor by my bed reading a card she had pulled out of a drawer in my night stand. It was a card that Chris had given me on one of our anniversaries. She was reading out loud (like first graders do :-)) the card and then her Dad’s handwriting. When she finished she looked up and said “why is Daddy writing like a girl?” So now you all know, my stoic, serious husband could be quite mushy :-). So after I got over my initial feeling of irritation for her getting in my stuff I was glad that she could “see” this side of her Dad even if it was just in a card. A fellow blogger, who is also a widow, has been posting about regrets in her last couple of entries. I have really enjoyed her biblical perspective. I’ve had a few people ask me if I have any regrets. Often memories come to mind of things I could have said or done differently and I cringe. So, yeah, I have regrets, who doesn’t? There’s plenty of things I wish I had never said to Chris. Things said in anger or frustration. I wish I had been quicker to forgive, and slower to speak. I wish I had been more patient, more respectful, more understanding, more supportive. I felt regret for all those things when he was alive but I guess the regret wasn’t so sharp then because there was always time to fix it or make up for it. Now there is no more time. Then the Lord reminds me of forgiveness and grace. These two things were weaved into our marriage over the years. We learned to give and accept both. So yes, I have regrets, but instead of dwelling on regrets, I would rather be thankful for the time the Lord gave us to develop the foundation of grace and forgiveness. I suppose I could pontificate on how to be careful of every little thing you say or do, because none of us knows when it is our “time” (which is not a bad thing to practice btw). But I would rather ask if you are living in grace and forgiveness in your marriage? Does your marriage or your life reflect the gospel with an eternal perspective? Anything else is a waste of your time. Look to the Cross. It is only the Cross that can wipe away regret. So while today certainly has it’s feelings of sadness, tinged with wishing things were different. It is also filled with thankfulness. Thankfulness for what God allowed me to have. Thankfulness for a good and sovereign Lord. One who never forsakes and who gives me the Hope of eternity, where there is no end to time. ← Learning to be alone…..
No words here to ease your pain on this special day to you and Chris. But I do have prayers, lots of them. Wishing you many more happy memories of your time with Chris and sending you love on this special day! Your wisdom and faith are a blessing to so many people. I do not know you, but a friend has shared your blog via Facebook(Debbie Phillips). Thank you for sharing what God has done and is doing in your life as you walk through your tremendous loss. Your testimony is far reaching, and is an incredible display of God’s grace. I pray God eases the pain you must feel on this day! Your heart once again reveals the cross,forgiveness and your hope in Christ and the love that you and Chris will have for eternity. God bless you always Nicole.